Austrian Airlines AG, sometimes shortened to Austrian, is the flag carrier of Austria and a subsidiary of the Lufthansa Group. The airline is headquartered in the grounds of Vienna International Airport in Schwechat where it also maintains its hub. It flies to 6 domestic and more than 120 international year-round and seasonal destinations in 55 countries as of July 2016. and is a member of the Star Alliance. Following disputes with staff over cost-cutting, all Austrian Airlines' flights were transferred on 1 July 2012 to its subsidiary Tyrolean Airways, which operated under the Austrian name. On 1 April 2015, all flights transferred back to Austrian, and Tyrolean Airways was merged into its parent. On 3 May 1923 Walter Barda-Bardenau received approval by the Austrian government for establishing an airline. He participated in the newly formed Austrian Airlines (German: Österreichische Luftverkehrs AG) with one percent, with the remaining shares went to the Austrian railway transportation company (50%) and the Junkers-Werke (49%). The initial fleet consisted of Junkers F 13's. The first flight of the company took place in Vienna on 14 May 1923 by Munich, with pilot Hans Baur. The landing took place in Vienna Jedlesee; there occurred a conversion to float and the connecting flight to Budapest. The company was operated by Junkers Trans European Union. Its destinations included Munich, Budapest, Nuremberg, Graz, Klagenfurt and St. Wolfgang. Some targets in Austria were served with seaplanes. The union was dissolved in September 1926. From 1927 the company procured new aircraft with support from the government. In the same year it began an operating partnership agreement with Deutsche Luft Hansa. Line connections were planned and operated jointly by the two companies. A route network to Berlin, Budapest and Milan ranged Vienna was created. In 1932 Luft Hansa Junkers held 49% interest. After the end of the world economic crisis the fleet with several Junkers Ju 52/3 m was added. In 1938, the company began planning of routes to Rome, Paris and London. Junkers Ju 90 planes were used. After the annexation of Austria by Germany in March 1938, these plans were abandoned. The airline was fully under the control of Lufthansa from 1 January 1939. In June 1939, the company was deleted from the commercial register. After the Second World War, Austria was separated from Germany, and Austria was left without a national airline. Austrian Airlines was formed as Österreichische Luftverkehrs AG through the merger of Air Austria and Austrian Airways. It began operations on 30 September 1957, making its maiden flight on 31 March 1958 when a leased Vickers Viscount 779 took off from Vienna for a scheduled service to Zurich and London. Six new Viscount 837s were delivered to the airline in early 1960. The operator's domestic services were launched on 1 May 1963. The airline's transatlantic services began on 1 April 1969 with a Vienna via Brussels to New York service in co-operation with Sabena. At first, Austrian Airlines had competition from Adria Airways: passengers from the Austrian provinces of Styria and Carinthia were commuting to Yugoslavia to use airports in what is now Slovenia. Austrian ordered its first jet airliner, the Sud Aviation Caravelle, on 18 February 1963 and the type was operated until 1973. From 1971, Austrian started to standardise its fleet in a short time frame in favour of nine Douglas DC-9-32s, that would serve for many years on short and medium-haul flights. In 1975, the first of five DC-9-51 was introduced. In 1977, Austrian become the first customer for the DC-9-80 (or McDonnell Douglas MD-80) along with Swissair. The first MD-81 entered service in October 1980, allowing longer-range flights. In 1984, Austrian became the first customer for the MD-87 and played a significant role in the project. The first MD-87 entered service at the end of 1987, as did the MD-83 from 1990, while six MD-81 were upgraded to MD-82 standards. In the 1990s, airlines focused on cooperation and alliances. Austrian was one of the first companies to join the Qualiflyer Group, founded by Swissair. It was also a time of quick expansion in long-haul flights, with flights to China and South Africa. In 2000, Austrian became a member of Star Alliance and acquired Lauda Air. It acquired Rheintalflug on 15 February 2001. Its name was shortened to Austrian in September 2003, when it renamed its three constituent carriers. On 1 October 2004 the Flight Operations Departments of Austrian and Lauda Air were merged into a single unit, leaving Lauda Air as a brand name only for charter flights. It had 6,394 employees. The other subsidiary, Tyrolean Airways, specialised in regional flights, and was merged with Rheintalflug. In October 2006, Austrian was forced to adopt a stringent cost-saving policy, and in 2007 it eliminated over 500 jobs. Many long-haul destinations were cancelled, such as Sydney via Kuala Lumpur, Melbourne via Singapore, Kathmandu or Shanghai. Three remaining Fokker 70 were sent to Tyrolean Airways. It was also decided to abandon the long-haul Airbus planes, consisting of four Airbus A340 and four Airbus A330, in order to standardise the fleet in favour of Boeing 777 and Boeing 767. Austrian Airlines removed complimentary in-flight meals and alcoholic drinks on short haul services, introducing what was called a "Self Select Bistro Service", except on flights from London and any flights above 100 minutes in duration. Head office moved from Oberlaa to Vienna Airport in 2007, whereas headquarters remained in Vienna itself. After a small profit of €3.3 million in 2007, financial guidance for 2008 had to be changed negatively several times, to a loss of €475 million expected as of end of November. In June 2008, the Merrill Lynch investment bank advised the Austrian Government to sell the airline to a foreign company. Interest was shown by Lufthansa, Air France-KLM, Royal Jordanian, Air China, Turkish Airlines, Aeroflot, S7 Airlines and Singapore Airlines. Of those, Lufthansa, Air France-KLM and S7 emerged. On 13 November 2008, state holding ÖIAG announced that Lufthansa was selected. The German company was to enter Austrian’s capital with a 41.6% share, for which it would pay €366,268.75. AUA CEO Alfred Ötsch and OIAG chairman Peter Michaelis were heavily criticised for revealing to Lufthansa that it had to take over the €500 million debt only when the deal had been made binding. Michaelis refused a new tendering procedure, but was made a scapegoat with his shareholder rights removed, and Ötsch resigned on 29 January 2013. In December 2011, a new cost-saving plan was revealed, as the company was still losing money despite eliminating 2500 jobs. Lufthansa refused to provide financial support. In March 2012, Austrian called once more for recapitalisation. Lufthansa approved a capital increase of €140 million, providing effective measure to be taken in order to address the structural deficiencies. The Lauda Air subsidiary was merged into Austrian Airlines on 1 July 2012. On April 30, 2012, after failure of negotiations over cost cutting measures, AUA operations were taken over by subsidiary Tyrolean Airways. After this date all Austrian flights were operated by Tyrolean. However 110 pilots and 250 flight personnel chose not to go to Tyrolean and to instead leave the group. Austrian Airlines retired its final Boeing 737, a 737-800 variant in Lauda Air markings, in April 2013 as part of its fleet consolidation exercise. The 11 Boeing 737s were replaced by seven Airbus A320s, with an expected annual saving of €17 million through the move to a single type. In October 2014 it was reported that Tyrolean's flight operations and staff would be reintegrated into Austrian Airlines by 31 March 2015 as a new labour agreement has been reached. Ahead of the merger, Austrian announced an overhauled concept called "my Austrian" on 26 March 2015. It includes a new corporate design, a revised aircraft livery, and a number of new routes. In June 2015, Austrian Airlines announced the purchase of 17 Embraer 195s from within the Lufthansa Group. These Embraer aircraft, which had been owned by Lufthansa CityLine, replaced the ageing Fokker 70s and 100s. By August 2016, 8 of 17 Embraer aircraft had been delivered while 9 of 23 Fokker left the fleet. In January 2016, it was announced that Austrian Airlines would revise its new branding introduced in spring 2015 by dropping the phrase "my" ahead of Austrian. This new feature had faced severe criticism before. Austrian Technik Bratislava, a maintenance company located at Bratislava Airport equipped for overhauls on Fokker and Embraer regional jets and on the Airbus A320 family. Austrian Airlines has been profitable (before interest and tax). Citing the colours of the national flag of Austria, Austrian Airlines' colour scheme has always been a pattern of red, white and red. 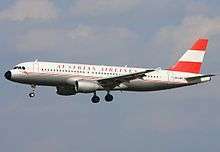 The aeroplanes' bellies were silver from the 1950s to 1980s, the upper part was white with the Austrian Airlines arrow and the text "Austrian Airlines" (until 1972, again from 1995 to 2003) or "Austrian" (1972–1995, from 2003 onwards). Austrian Airlines' slogan was "the friendly airline" at the time. As part of the 2015 rebranding, the blue belly and engine painting of the livery were replaced by white and red. The Austrian Airlines' arrow ("Austrian Chevron") has seen several design modifications over the years. When created in 1960 it was redolent of the shape of a paper aeroplane; the design became more formal in 1972. As part of a rebranding exercise in 1995, the "Chevron" was placed on the red-white-red tail fin. In the new corporate design, in use since 2003, the old "Chevron" shape was used again, this time in a more modern style and with a drop shadow placed underneath. Several special colour schemes have been used throughout the decades. Since joining Star Alliance, a few aeroplanes have flown with Star Alliance markings. For the Mozart year in 2006, an Airbus A320 was decorated in a Mozart design, and an Airbus A340-300 was coated with an hommage to the Vienna Philharmonic orchestra. A Boeing 737-600 was given a glacier look for a Tyrol advertisement. Three designs were put on aeroplanes to mark Euro 2008. An Airbus A320 was given a retro livery on the occasion of the 50th anniversary of the company. The current slogan of Austrian is: "the charming way to fly". In 2006, Austrian decided to retire its A330 and A340 fleet, which consisted of four Airbus A330-200, two Airbus A340-200 and two Airbus A340-300. These aircraft were sold to TAP Portugal, Swiss and the French Air Force. As a result of having less long haul capacity, Austrian suspended some of its long-haul flights to East Asia. Flights to Shanghai, Phuket, Mauritius, Colombo, Malé and Kathmandu ended in 2007. Both Australia routes - Melbourne via Singapore and Sydney via Kuala Lumpur - were terminated in March 2007, ending operations on the Kangaroo Route. Austrian was the last European-based airline offering direct flights from Melbourne to Europe. It started with the Lauda aircraft, and then used Austrian airlines aircraft. Austrian was one of the few airlines to fly into post-war Iraq when it began flights to Erbil in December 2006. New flights to Mumbai began on November 2010 and Austrian resumed flights to Baghdad on 8 June 2011. On January 13, 2013, Austrian Airlines suspended flights to Tehran due to a lack of demand. Austrian Airlines resumed flights to Chicago on May 17, 2013 and launched Newark in 2014. Austrian Airlines start services to Mauritius with the beginning of the winter-flightplan 2015. The expansion of the intercontinental network seems to indicate improving results for Austrian, with Lufthansa placing its confidence in the airline. Austrian Airlines begin services to Mauritius and Miami in October 2015. Austrian Airlines has announced that it will commence service to Los Angeles on April 10, 2017; which will be the longest non-stop Austrian flight ever; covering a distance of 9,877 kilometers or 6,137 miles. Flight time will take about 12 hours and 30 minutes, aboard Boeing 777-200ER. Airbus A321-200 3 — var. Business class cabin on one of Austrian's long-haul aircraft. Austrian operates several lounges at its hub in Vienna. There are three Business, two Senator and two HON-Circle lounges available. Furthermore, a Business lounge at Domodedovo International Airport in Moscow is operated by Austrian Airlines. Since 2007 Do & Co handles the catering of Austrian Airlines. On long-haul flights, Business Class meals are prepared by a chef on board. Since 2011 all Austrian planes of the Airbus A320 family are equipped with new seats and a new cabin design. By September 2013 Austrian's entire long-haul-fleet (Boeing 767 and Boeing 777) also got new seats and a new cabin design. It contains full-flat-beds with a pneumatics-system and aisle access from nearly every seat in Business Class, and new seats with video-on-demand for every passenger in Economy Class. The following is a list of incidents and accidents involving Austrian Airlines mainline aircraft. It excludes occurrences with subsidiaries, such as Tyrolean Airways or Austrian Air Services. 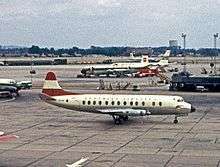 On 26 September 1960 at 21:40 local time, an Austrian Airlines Vickers Viscount (registered OE-LAF) crashed during approach of Sheremetyevo International Airport, killing 26 of the 31 passengers on board, as well as five of the six crew members. The aircraft had been operating Flight 901 from Vienna to Moscow with an intermediate stop at Warsaw. As a probable cause for this to date only fatal accident for the airline, a malfunction in an altimeter was given. On 21 February 1970, a bomb explosion occurred in the cargo hold of an Austrian Airlines Sud Aviation Caravelle (registered OE-LCU) during a flight from Frankfurt to Vienna with 33 passengers and five crew on board, creating a hole in the fuselage. The pilots managed to return the aircraft safely to Frankfurt Airport. On the same day, another bomb had been planted on Swissair Flight 330, causing it to crash, killing 47 people. The Popular Front for the Liberation of Palestine claimed the responsibility for both assaults. On 7 January 1997, Austrian Airlines Flight 104 from Berlin to Vienna was hijacked by a Bosnian man who had forced his way into the cockpit armed with a knife (which was of a size small enough not to be banned from aeroplanes under regulations in force at the time). The pilots obeyed the perpetrator's demands to return to Berlin, so that he could negotiate with the local authorities over the renewal of his visa. Back at Berlin Tegel Airport, the McDonnell Douglas MD-87 was stormed by special police forces, and the hijacker was overpowered. On 5 January 2004 at 08:17 local time, an Austrian Airlines Fokker 70 (registered OE-LFO) crash-landed on a snow-covered field near Munich International Airport. The aircraft had been operating Flight 111 from Vienna to Munich, with 28 passengers and four crew on board, when its engines failed during landing descent due to icing. The aircraft was severely damaged, however only three passengers suffered minor injuries. 1 2 3 "Directory: World Airlines". Flight International. 27 March 2007. p. 81. 1 2 "Overview of Key Facts & Figures for Q4 2014 and 2014" (Press release). Austrian Airlines. 12 March 2014. Retrieved 22 May 2015. 1 2 "First-quarter 2015 results: Austrian Airlines Slightly Improves Earnings by EUR 1 Million" (Press release). Austrian Airlines. 5 May 2015. Retrieved 22 May 2015. ↑ "Company". Lufthansa Group. Retrieved 4 July 2015. ↑ "Tyrolean to merge with Austrian Airlines next spring". Retrieved 24 April 2015. ↑ "AUA am Boden: 475 Millionen Verlust «". Diepresse.com. Retrieved 2012-10-07. ↑ news networld Internetservice GmbH (2008-09-24). "Austrian Airlines-Privatisierung: Letzter Aufruf für Lufthansa, Air-France und S7 •". Format.at. Retrieved 2012-10-07. ↑ "ROUNDUP: Austrian Airlines soll an Lufthansa gehen - Abschluss in vier Wochen". Finanznachrichten.de. 2008-11-13. Retrieved 2012-10-07. ↑ "Aktienrecht als Wachs in den Händen von Österreichs Politikern - NZZ.ch, 24.02.2009". Nzz.ch. Retrieved 2012-10-07. ↑ "Alfred Ötsch resigns as Chief Executive Officer of Austrian". Bloomberg. 2009-01-29. Retrieved 2013-12-08. ↑ "AUA-Übernahme am seidenen Faden «". Diepresse.com. 2010-03-31. Retrieved 2012-10-07. ↑ "Green Light for Merger of Austrian Airlines and Lufthansa | News". Breaking Travel News. Retrieved 2012-10-07. ↑ "BRIEF-Austrian Airlines shares suspended - Vienna bourse". Finanznachrichten.de. Retrieved 2012-10-07. ↑ "AUA braucht Sparpaket: Jobabbau und Gehaltsverzicht? «". Diepresse.com. 2012-03-13. Retrieved 2012-10-07. ↑ "Luftfahrt-Nachrichten und -Community". aero.de. 2012-03-15. Retrieved 2012-10-07. ↑ derStandard.at (2012-04-30). "AUA-Verhandlungen geplatzt - Lufthansa-Gruppe - derStandard.at " Wirtschaft". Derstandard.at. Retrieved 2012-10-07. ↑ "Luftfahrt-Nachrichten und -Community". aero.de. 2012-04-30. Retrieved 2012-10-07. ↑ 03.06.2012, 09:11 (2010-03-31). "Österreich « Nachrichten «". Wirtschaftsblatt.at. Retrieved 2012-10-07. 1 2 "aero.de - Luftfahrt-Nachrichten und -Community". aero.de. Retrieved 24 April 2015. ↑ "aero.de - Luftfahrt-Nachrichten und -Community". aero.de. Retrieved 24 April 2015. ↑ "Austrian, Tyrolean flight crew union near labour agreement deal". ch-aviation. Retrieved 24 April 2015. ↑ "New Austrian: Viel Neues bei der AUA". austrianaviation.net. Retrieved 24 April 2015. 1 2 3 "Austrian Airlines Supervisory Board Approves Purchase of 17 Embraer Jets". Austrian Airlines. 3 June 2015. Retrieved 3 June 2015. ↑ "AUA expandiert mit Fokker-Werft". Retrieved 2016-08-24. ↑ "Ein Kommen und Gehen bei der AUA-Flotte". Retrieved 2016-08-24. 1 2 3 4 5 6 7 "Annual Reports". Austrian Airlines. Retrieved 30 September 2013. 1 2 "Annual results for 2012" (Press release). Austrian Airlines. Retrieved 30 September 2013. ↑ "Annual results for 2013: Austrian Airlines Achieves Operating Result of EUR 25 Million" (Press release). Austrian Airlines. 13 March 2014. Retrieved 24 April 2015. ↑ "Annual results 2015: Austrian Airlines Generates Good Operating Results" (Press release). Austrian Airlines. 17 March 2016. Retrieved 25 March 2016. ↑ Clark, Jonny (30 March 2015). "Austrian Airlines Launches New Livery And New Brand Direction". The Design Air. Retrieved 31 May 2015. ↑ "Austrian Airlines Review & Opinions - Overview with pictures (including Lauda Airlines & Austrian Arrows)". Airreview.com. Retrieved 2012-10-07. ↑ "Where Iraq Works". Time. 5 April 2007. Retrieved 25 April 2010. ↑ Social Post (2006-12-12). "Austrian Airlines starts scheduled flights to Iraq | India - Oneindia News". News.oneindia.in. Retrieved 2012-10-07. ↑ Airlines stop Iran flights as sanctions hit economy | JPost | Israel News. JPost. Retrieved on 2013-08-20. ↑ "Austrian Airlines Returns to Chicago". Routesonline. 2012-11-12. Retrieved 2012-11-22. ↑ "Austrian Airlines expanding - Business News - Austrian Times Online News - English Newspaper". Austriantimes.at. Retrieved 2012-11-22. ↑ "AUA Invests € 80m in Long Distance Flights". FriedlNews. 2012-07-30. Retrieved 2012-11-22. ↑ "AUA: Neue Destination, zusätzliche Flugzeuge". austrianaviation.net. Retrieved 24 April 2015. ↑ Austrian Airlines (9 March 2015). "Austrian Airlines fliegt nach Miami und Menorca". Retrieved 24 April 2015. ↑ "Profile on Austrian Airlines". CAPA. Centre for Aviation. Archived from the original on 2016-10-31. Retrieved 2016-10-31. ↑ "Austrian aircraft register". Austro Control. 30 September 2016. Retrieved 7 October 2016. ↑ "Austrian Airlines Invests in Additional Aircraft at the Vienna Flight Hub" (Press release). Austrian Airlines. 29 September 2016. Retrieved 5 October 2016. ↑ "Austrian confirms CityLine E195s will replace Fokker fleet". ch-aviation. Retrieved 24 April 2015. ↑ "book cheap flights now". Austrian Airlines. Retrieved 2012-10-07. ↑ "Austrian Airlines Fleet | Airfleets aviation". Airfleets.net. 2012-07-01. Retrieved 2012-10-07. ↑ Zur Ausmusterung der 737 bei der AUA | Austrian Wings. Austrianwings.info. Retrieved on 2013-08-20. ↑ "Fleet harmonisation completed on medium-haul fleet". Austrian Airlines. Retrieved 2 April 2013. ↑ tyrolean CRJ - Sag zum Abschied Servus | Austrian Wings. Austrianwings.info. Retrieved on 2014-01-14. ↑ Austrian führt allerletzten CRJ-Passagierflug durch | Austrian Wings. Austrianwings.info. Retrieved on 2014-01-14. ↑ "Foto- und Videobericht: Ankunft des ersten AUA-Embraer E-195 in Wien" (in German). Retrieved 2016-08-24. ↑ "Austrian Lounges at the Star Alliance Terminal". Austrian.com. Retrieved 2012-11-11. ↑ "AUA präsentiert neue Sitze | Austrian Wings". Austrianwings.info. Retrieved 2012-10-07. ↑ Austrian Aviation Net (2012-03-29). "Austrian Aviation Net: Thompson Aero Seating erneuert AUA-Flotte". Austrianaviation.net. Retrieved 2012-10-07. ↑ "Accident description". Aviation Safety Network. Retrieved 20 July 2011. ↑ "ASN Aircraft accident Sud Aviation SE-210 Caravelle VIR OE-LCU Frankfurt". Aviation-safety.net. 1970-02-21. Retrieved 2012-10-07. ↑ "1970 | 0326 | Flight Archive". Flightglobal.com. Retrieved 2012-10-07. ↑ "ASN Aircraft accident McDonnell Douglas MD-87 registration unknown Berlin-Tegel Airport (TXL)". Aviation-safety.net. 1997-01-07. Retrieved 2012-10-07. ↑ "Investigation Report - Fokker 70" (PDF). BFU Germany. November 2005. Retrieved 18 December 2011. ↑ "Accident Database: Accident Synopsis 01052004". Airdisaster.com. 2004-01-05. Retrieved 2012-10-07. ↑ "ASN Aircraft accident Fokker 70 OE-LFO München-Franz Josef Strauss Airport (MUC)". Aviation-safety.net. Retrieved 2012-10-07. 1 Lufthansa has an option to acquire the remaining stake at any time.